One of the most exciting reveals at this year’s Monaco Yacht Show came from Italian shipbuilder CRN, who presented its latest design projects. CRN is part of the famous Ferretti Group, renowned as a world leader in designing and building exclusive brands of motor yachts and pleasure vessels. And the projects on display at the show certainly did not disappoint. 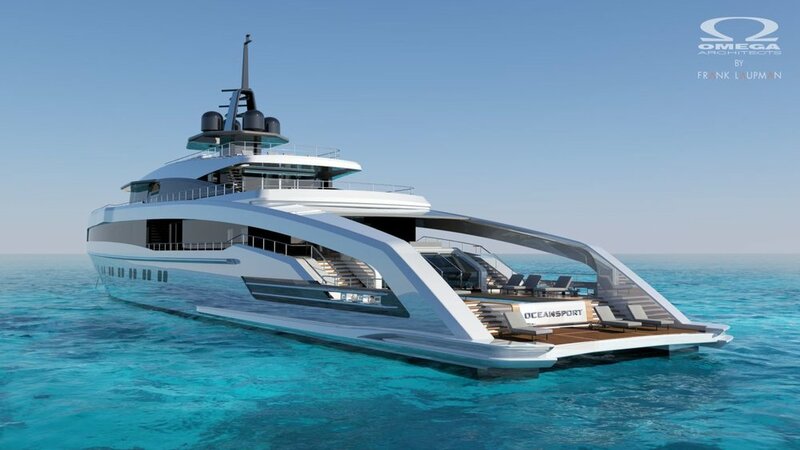 The shipbuilder, which specializes in building fully custom steel and light aluminum alloy pleasure vessels, is constantly developing new concepts, and works together with international designers renowned for their innovative talent. This year, CRN’s world-class craftsmanship was on display in the form of five magnificent yacht design projects ranging in size from 55 meters to 72 meters. The projects, like others created by the shipbuilder, are destined to become real trendsetters in the yachting world. First up is the 55m M/Y CRN Superconero, designed by Zuccon International Projects and engineered by CRN Engineering. The yacht, at 55 meters long and 9 meters wide, falls within the 500 GRT class. It’s an exceptional vessel, featuring all of CRN’s main solutions, including a balcony that can be enjoyed whilst cruising. There’s a terrace that opens up onto the sea that is perfect when the yacht is at anchor, an aft beach club, as well as a float-in garage for the tender. The result is a single, open area connected to the beach club, creating a wide lounge area at sea level. The yacht design features vast internal spaces; there are also expansive full-height windows that offer a feeling of being in contact with nature. All in all, the 55m M/Y Superconero is a truly exceptional, one-of-a-kind yacht, perfect for those who wish to experience total freedom at sea. Omega Architects designed two exceptional yacht projects for CRN: M/Y Oceansport that comes in a 61m and an impressive 75m version. 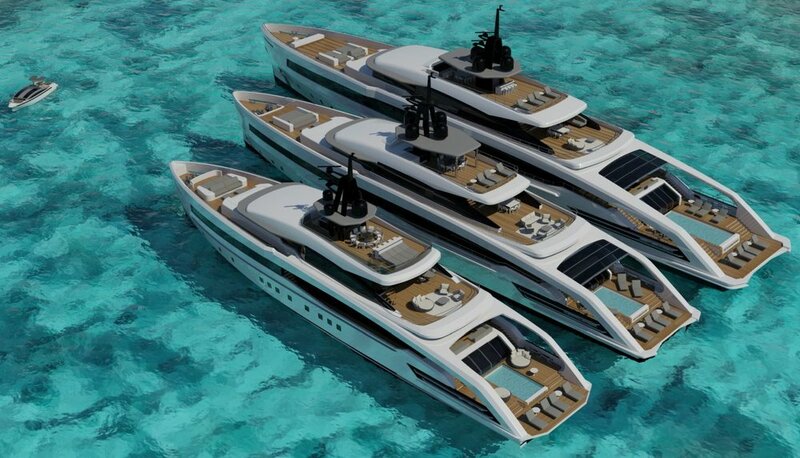 These two mega yachts, which will have a beam of 11m and 13m respectively, draw inspiration from the same concept. 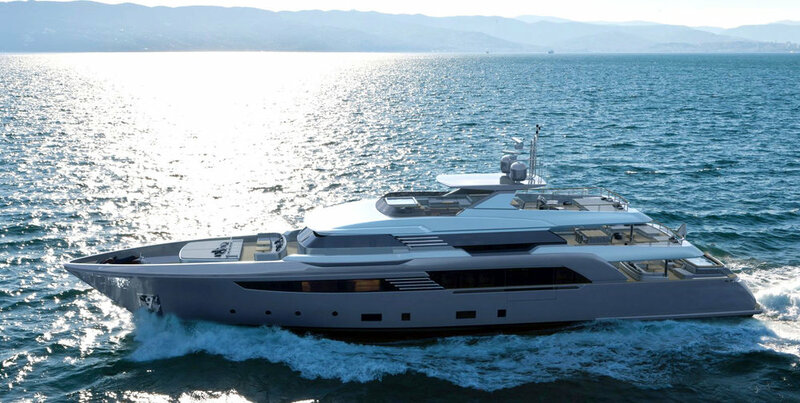 They combine the outstanding seaworthiness that is a signature of CRN naval platforms as well as a sporty, streamlined profile typical of all Omega Architects’ creations. In addition, both yachts will boast harmonious, slender lines that are further highlighted by dark side windows joined together to create a long, uninterrupted dark glazing that cuts across the main and upper decks. Both of these exquisite yachts are designed and engineered with a meticulous attention to detail when it comes to proportion, ensuring that all the guest areas are spacious and light. The beach clubs offer a wellness and fitness area, including a sauna, gym and swimming pool. Both yachts feature full-height windows on both sides in the aft area of the main deck, offering breathtaking sea views without compromising on privacy. The 72m M/Y CRN is another masterpiece project from Francesco Paszkowski Design; its first was also the first super yacht built in collaboration with CRN. 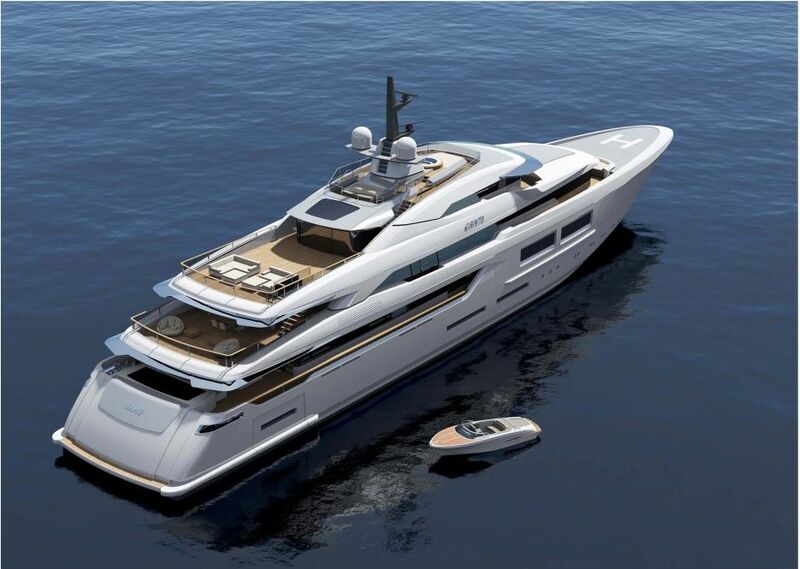 The new 72m design boasts much larger volumes and many innovative architectural solutions. These include increasingly slender lines, resulting in a very light silhouette. Also, the rounded shapes in the design have created a more compact yacht. Finally, there is an extensive use of linear glazed surfaces and see-through balconies, making it seem as if there is no barrier between the vessel and the sea outside. At 72 meters in length and 13 meters wide, this extraordinary vessel is designed for optimum comfort and relaxation. There are several dining areas, as well as an entertainment area on the upper deck, a gym, sauna and massage room. Spaciousness and connectivity with the outside has been created by using terraces with sea views, outdoor swimming pools, wide glazed surfaces and the spacious beach club. Wherever you look, you can see the sea. CRN’s final masterpiece is the 62m M/Y CRN that is being created in collaboration with Italian design firm Nuvolari Lenard who handled the concept as well as interior and exterior design. The yacht is designed to be 62m long and boasts a beam of 12m; it has a soft, sinuous line that creates almost a wave-like movement. In addition, the superstructure ends in a clear-cut vertical line onto the inverted bow. The result is a pleasure vessel that offers magnificent sea views, with a master deck with the owner’s suite located aft. This concept will begin construction at the end of 2016, and be launched in 2019. Three other new megayachts are currently under construction at CRN’s shipyard, the building facility for the Ferretti Group’s large vessels, which is also one of the leading pleasure boat hubs in Europe. These include the second largest vessel ever to be built by CRN, the 79m M/Y CRN 135, whose exteriors are being designed by Zuccon International Project and interiors by Laura Sessa. There’s also the 74m M/Y CRN 131, which is expected to be launched over the next few months. Its exteriors were developed together with Zuccon International Project, and interiors created by Andrew Winch Interior Designer in cooperation with CRN Interior Design.